Nose: The nose starts off with a fresh sea breeze and subtle peaty notes. Then sweet with delicate vanilla and a hint of apricots. Coal ash, pepper, nutmeg and a touch of medicinal flavours in the back. Palate: Sweeter on the palate than the nose suggests with custard and creamy apricots. Then a warming spiciness arrives with oak, white pepper, caramelised ginger and nutmeg. A touch of malt, mixed with honey and peat smoke towards the finish. Finish: The finish is long, warm and creamy with acacia honey and subtle vanilla. Spicy towards the end with oak, pepper, crisp peat and a hint of smoke. With water: A few drops of water bring more fruity flavours to the fore - apricots, peaches and pears. The spicy and peaty notes are significantly tamed. Sweet and nicely fruity on the palate. There's only a hint of spice and coal ash while the finish is shorter, slightly warm and sweet with vanilla and dry notes of oak on the tail. Comments: A beautiful, straightforward dram without many edges. Subtle fruit and vanilla sweetness, that is more pronounced on the palate. This is beautifully integrated into filigree peat smoke notes, although I miss the salty character, which I prefer in Springbank single malt. The finish is wonderfully long with a nice balance of sweetness and spicy peat smoke. Something for the long winter evenings! Nose: Rich and intense flavours of old sherry, nicely mixed with ripe dark fruit, amarena cherries, chocolate-coated raisins, prunes and black currants. Notes of polished oak emerge, followed by tobacco leaves and a slightly maritime edge of sea air, hints of fuel oil with a whiff of salt. A gorgeous nose! You can nose this for hours and this diverse malt changes all the time. Palate: Very rich, sweet and intense on the palate. Sherry sweetness and Demerara sugar are nicely complemented by an intense warming spiciness of cracked black pepper, oak, and subtle cinnamon. Once the spiciness fades lovely sweet and complex fruitiness comes through with sticky plum jam, dates and raisins. Dry notes of leather and dark chocolate linger towards the finish. Very delicate and multilayered. Finish: The finish is long and slightly sweet with a lovely bitter touch of herbs, lovage in particular. Subtle warm on the tongue with sticky plum jam, and lingering walnut flavours, nicely complemented by a slightly maritime edge with tender brine. With water: A splash of water underlines the lovely sweetness and fruitiness of this beauty with creamy notes of sherry and less maritime influence. Still bold and intense on the palate with a sweet and spicy mix of ripe fruit, sherry and herbs. The finish is medium long, sticky sweet and significantly dry with herbs, oak and leather on the tail. Simply perfect! Comments: A bold, intense but at the same time relaxing dram. Very complex and sweet. Multiple layers of sweet, fruity, spicy and herbal flavours are lovely interlocked resulting in a wonderful and long taste sensation. Although the heavy sherry influence softens the Campbeltown character, this beautiful malt still preserves its tender maritime character. A must have not only for the sherry aficionados but also for connoisseurs of great whiskies. I thank Christian Priess (LoveWhisky.de) for the photograph! Nose: The nose starts off with delicate sherry flavours, Demerara sugar, toffee and almonds. Subtle fruity notes of pineapple and passion fruit mingle with lingering cinnamon and a whiff of smoke and salt in the back. Quite oily, rich and very pleasant. Palate: Full and rich on the palate. Creamy sherry aromas and exotic fruit notes are complemented by intense spices - oak, cinnamon, crystallised ginger, and white pepper. Raisins, dark chocolate, and fine marzipan linger towards the warm finish. Amazing! Finish: A fairly long finish with a gentle warmth. Crisp oak and sherry flavours sustain and mingle with delicate cinnamon and a touch of leather. With water: Lively, quite vibrant on the nose with sherry, toffee, oak, cinnamon and a delicate fruity sweetness with a touch of smoke. Bold and intense on the palate with lots of sherry flavours and a warm and delicious mix of various spices - oak, cinnamon, nutmeg, Demerara sugar and pepper. The finish is long, sweet and warm with a delicate cinnamon note on the tail. 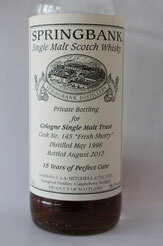 Comments: This Springbank is a rich and multi-layered malt full of delicate sherry flavours, spice, dried fruits and lingering chocolate notes. Very well balanced, nicely oily with a dash of salt. An exceptional and appealing dram best enjoyed after dinner in front of an open fire. Nose: The nose starts off with a lots of ripe dark fruit, amarena cherries, sweet malted barley, and lingering chocolate. A whiff of sour notes is coming through, maybe thick balsamic vinegar, along with some oak and a touch of tobacco smoke. Although almost 59% abv, the alcohol isn't pungent at all but extremely well-interated. A gorgeous nose! Palate: A rather sweet start on the palate with sherry, dark cherry marmalade and a lingering nuttiness. Quite spicy on the midpalate with pepper and chilli. A touch of sulphur emerges before bitter dark chocolate and marzipan take over with a slightly dominant kick of saltiness in the end. A bit reserved, maybe due to the high abv. Finish: Very long, warm and spicy in the finish, with fruity and bitter notes of orange, chocolate, raisins and nuts. Lingering oak tannins emerge, sticking endlessly on the tongue. With water: Now the whisky awakes! Vibrant, more spice on the nose and palate, with lots of sherry, fruit and an increased amount of delicate marzipan. Perfekt! Comments: A bold, intense and restorative dram. Complex and very sweet. Admittedly, the sherry softens the Campbeltown character, but this one has an extra dimension of flavours that we sherry aficionados desire. I prefer it with a splash of water which awakes this beauty. Nose: The nose starts of with gentle peat and smoke, along with lots of sherry and subtle wine aroma, followed by rum soaked raisins. This is complemented by a smouldering fire and a touch of citrus type notes. A delicate nose, well-balanced with fully integrated alcohol. 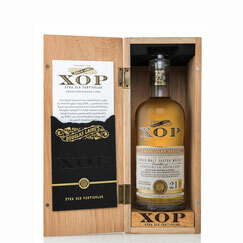 Palate: Very sweet with rum, raisins and sherry, warm and significantly spicy with cracked black pepper. A touch of vanilla is coming through, complemented by citrus flavours, lemon which turns to orange after a while. Creamy, drier in the end with crisp oak. Extremely mouthfilling! Finish: A long and warm finish with lots of spice on the tongue, pepper and cinnamon, even cloves. Thick and rich with smoky vanilla and lingering bitter orange peel, along with hints of salt. With water: Raisins and lots of nougat on the nose along with increased smouldering smoke. It's creamy and less spicy on the palate with a fruity sweetness and delicious chocolate. The finish is still long with lingering smoke and dry orange peel. Comments: A very delicate single malt. Well-balanced with fruits, sherry and bitter flavours, along with gentle smoke and salt. Water increases the fruitiness and tames the alcohol a bit. To me, this combination of sherry cask and spingbank spirit is a fantastic match. A perfect back from a cold night out dram! I thank Harry Hammelmann (Scottsman in Speyer) for this generous gift!